One of the few aspects of my job I enjoy more than designing a new market is actually building it. Turning some wild concept that sprung from the minds of a bunch of scientists into a working artifact is a huge rush, and I can only smile as people from around the world commence tinkering with the thing, often in ways I never expected. The “build it” phase of a research project, besides being a ton of fun, inevitably sheds important light back on the original design in a virtuous cycle. In that vein, I am thrilled to announce the beta launch of PredictWiseQ, a fully operational example of our latest combinatorial prediction market design: “A tractable combinatorial market maker using constraint generation”, published in the 2012 ACM Conference on Electronic Commerce. You read the paper.1 Now play the game.2 Help us close the loop. PredictWiseQ is our greedy attempt to scarf up as much information as is humanly possible and use it, wisely, to forecast nearly every possible detail about the upcoming US presidential election. For example, we can project how likely it is that Romney will win Colorado but lose the election (6.2%), or that the same party will win both Ohio and Pennsylvania (77.6%), or that Obama will paint a path of blue from Canada to Mexico (99.5%). But don’t just window shop, go ahead and customize and buy a prediction or ten for yourself. Your actions help inform the odds of your own predictions and, crucially, thousands of other related predictions at the same time. 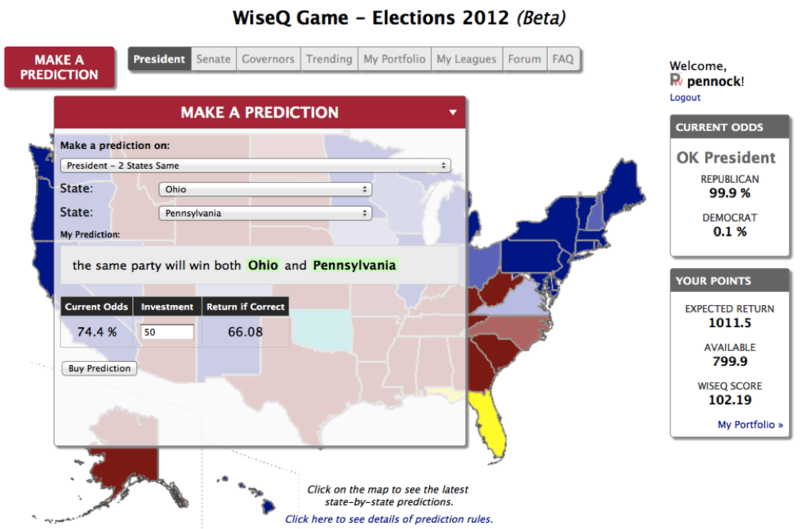 For example, a bet on Obama to win both Ohio and Florida can automatically raise his odds of winning Ohio alone. That’s because our market maker knows and enforces the fact that Obama winning OH and FL can never be more likely than him winning OH. After every trade, we find and fix thousands of these logical inconsistencies. In other words, our market maker identifies and cleans up arbitrage wherever it finds it. But there’s a limit to how fastidious our market maker can be. It’s effectively impossible to rid the system of all arbitrage: doing so is NP-hard, or computationally intractable. So we clean up a good bit of arbitrage, but there should be plenty left. So here’s a reader’s challenge: try to identify arbitrage on PredictWiseQ that we did not. Go ahead and profit from it and, when you’re ready, please let me and others know about it in the comments. I’ll award kudos to the reader who finds the simplest arbitrage. Why not leave all of the arbitrage for our traders to profit from themselves? That’s what nearly every other market does, from Ireland-based Intrade, to Las Vegas bookmakers, to the Chicago Board Options Exchange. The reason is, we’re operating a prediction market. Our goal is to elicit information. Even a completely uninformed trader can profit from arbitrage via a mechanical plug-and-chug process. We should reserve the spoils for people who provide good information, not those armed (solely) with fast or clever algorithms. Moreover, we want every little crumb of information that we get, in whatever form we get it, to immediately impact as many of the thousands or millions of predictions that it relates to as possible. We don’t want to wait around for traders to perform this propagation on their own and, besides, it’s a waste of their brain cells: it’s a job much better suited for a computer anyway. Intrade offers an impressive array of predictions about the election, including who will win in all fifty states. In a sense, PredictWiseQ is Intrade to the 57th power. In a combinatorial market, a prediction can be any (Boolean) function of the state outcomes, an ungodly degree of flexibility. Let’s do some counting. In the election, there are actually 57 “states”: 48 winner-takes-all states, Washington DC, and two proportional states — Nebraska and Maine — that can split their electoral votes in 5 and 3 unique ways, respectively. Ignoring independent candidates, all 57 base “states” can end up colored Democratic blue or Republican Red. So that’s 2 to the power 57, or 144 quadrillion possible maps that newscasters might show us after the votes are tallied on November 6th. A prediction, like “Romney wins Ohio”, is the set of all outcomes where the prediction is true, in this case all 72 quadrillion maps where Ohio is red. 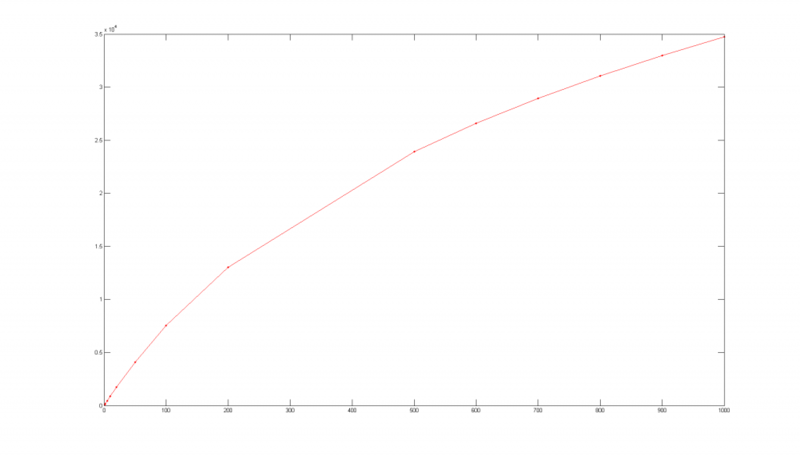 The number of possible predictions is the number of sets of outcomes, or 2 to the power 144 quadrillion. That’s more than a googol, though less than a googolplex (maybe next year). To get a sense of how big that is, if today’s fastest supercomputer starting counting at the instant of the big bang, it still wouldn’t be anywhere close reaching a googol yet. Create your own league to compare your political WiseQ among friends. If you tell us how much each player is in for, we’ll tell you how to divvy things up at the end. Or join the “Friends Of Dave” (FOD) league. If you finish ahead of me in my league, I’ll buy you a beer (or beverage of your choice) the next time I see you, or I’ll paypal you $5 if we don’t cross paths. 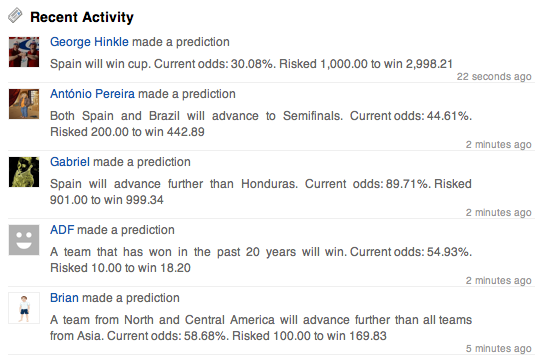 PredictWiseQ is part of PredictWise, a fascinating startup of its own. Founded by my colleague David Rothschild, PredictWise is the place to go for thousands of accurate, real-time predictions on politics, sports, finance, and entertainment, aggregated and curated from around the web. The PredictWiseQ Game is a joint effort among David, Miro, Sebastien, Clinton, and myself. The academic paper that PredictWiseQ is based on is one of my favorites — owed in large part to my coauthors Miro and Sebastien, two incredible sciengineers. As is often the case, the theory looks bulletproof on paper. But I’ve learned the hard way many times that you don’t really know if a design is good until you try it. Or more accurately, until you build it and let a crowd of other people try it. So, dear crowd, please try it! Bang on it. Break it. (Though please tell me how you did, so we might fix it.) Tell me what you like and what is horribly wrong. Mostly, have fun playing a market that I believe represents the future of markets in the post-CDA era, a.k.a the digital age. Crowdpark is an impressive, well-designed prediction market game that’s already attracted 500,000 monthly active users on Facebook, the 11th fastest growing Facebook app in April. It’s a dynamic betting game with an automated market maker, not unlike Inkling Markets in functionality (or even Predictalot minus the combinatorial aspect). What stands out is the flashy UI, both literally and figuratively. The look is polished, slick, refreshing, and richly drawn. It’s also cutesy, animation-happy, and slow to load. Like I said, Flash-y in every way. The game is well integrated into Facebook and nicely incorporates trophies and other social rewards. Clearly a lot of thought and care went into the design: on balance I think it came out great. Crowdpark is a German company with an office in San Francisco. In addition to their Facebook game, they have German and English web versions of their game, and white-label arrangements with gaming companies. They launched in English just last December. Crowdpark’s stunning growth contrasts with decidedly more mixed results on this side of the Atlantic. I wonder how much of Crowdpark’s success can be attributed to their German roots, their product, their marketing, or other factors? Here is the raw data and the fit to LMSR with b=20,000. Still, there’s a quote buried in the video at 0:55 that caught my attention: “you’re current profit is determined by the fluctuation of the odds”. With every other market maker, indeed almost every prediction market, the profit is fixed at the time of the bet. Add to that the fact that Crowdpark bought a majority stake in Florida horse racing circuit Saratoga Racing Inc. and plans to operate all bets exclusively through their system, leads me to wonder if they may have some kind of parimutuel variant, the only style of betting that is legal in the US. Of course, it may be that I simply misinterpreted the video. The technical exec at Crowdpark seems to be Aleksandar Ivanov. 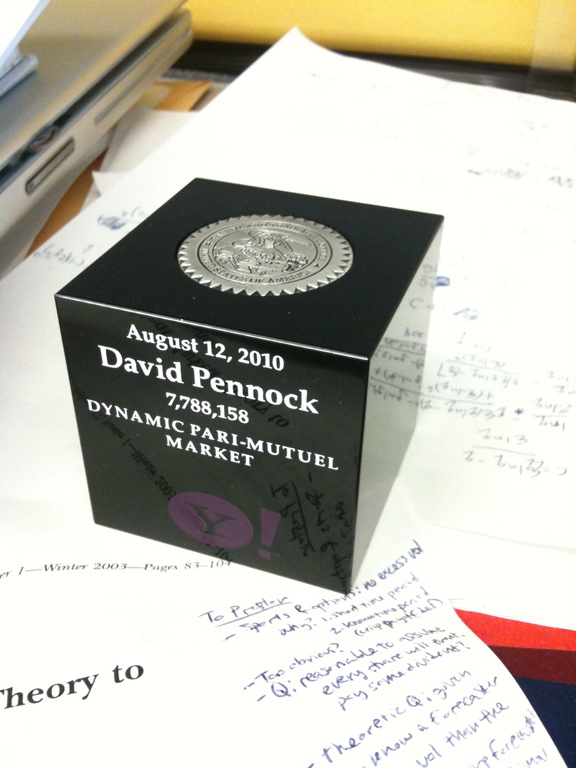 I found a trade press paper on (internal) prediction markets he wrote in 2009 for the Journal of Business Forecasting. March Madness thingnaming: Core 64, True 32? This year’s men’s college basketball tournament featured four play-in games called the First Four that the NCAA officially designated as the “first round”. They renamed what used to be called the first round — the truly mad round where 64 teams play 32 games in 2 days — the “second round”. But tradition is hard to break. Many people ignored the official names and kept right on calling the 64-team stage the “first round”. Naming confusion ensued. For Predictalot, we sidestepped the problem by calling the first two major rounds the “round of 64” and the “round of 32”. Interestingly enough, Yahoo! Sports independently adopted the same convention. Today, Yahoo! 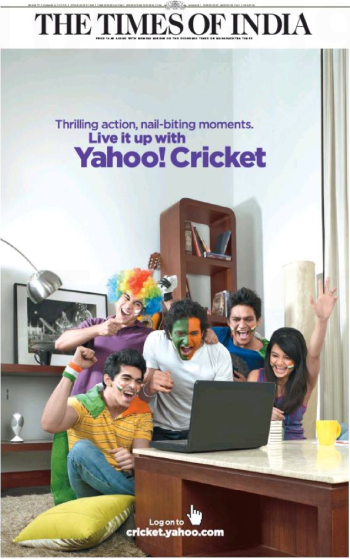 placed two full-page ads on the back cover of the Times of India, the largest English-language daily in the world, to promote Yahoo! Cricket, a site that reaches 13.4 percent of everyone online in India and serves as the official website of the ICC Cricket World Cup. 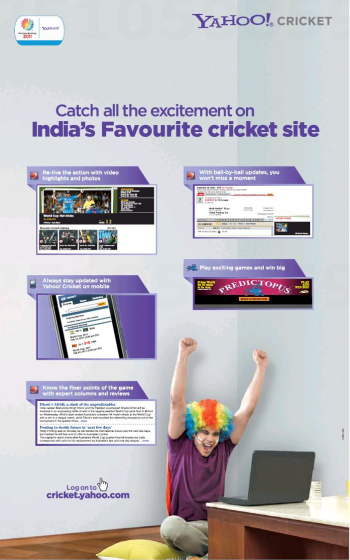 Take a look at the middle right of the second page: it says “Play exciting games and win big” and features… Predictopus! 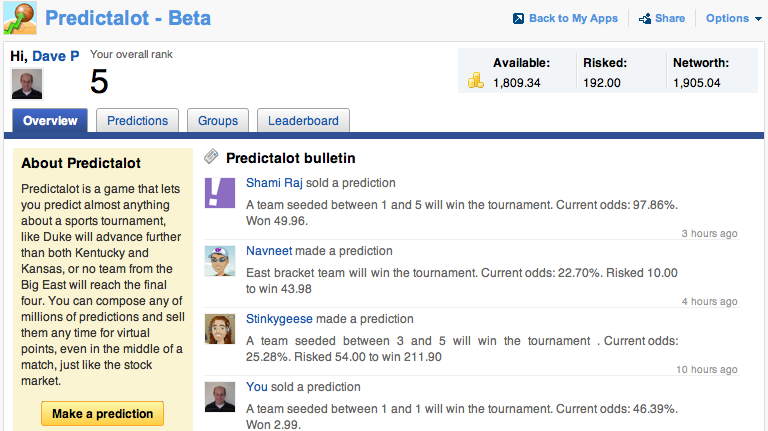 That’s the Indian spinoff of Predictalot, the combinatorial prediction game I helped invent. Predictopus has nearly 70,000 users and counting, and this ad certainly won’t hurt. BTW, I grabbed these images from an amazing site called Press Display, which I discovered via the New York Public Library. I’m thrilled to report that Predictalot had an Indian makeover, launching as Predictopus* for the ICC Cricket World Cup. The Yahoo! India team did an incredible job, leveraging the idea and some of the code base of Predictalot, yet making it their own. 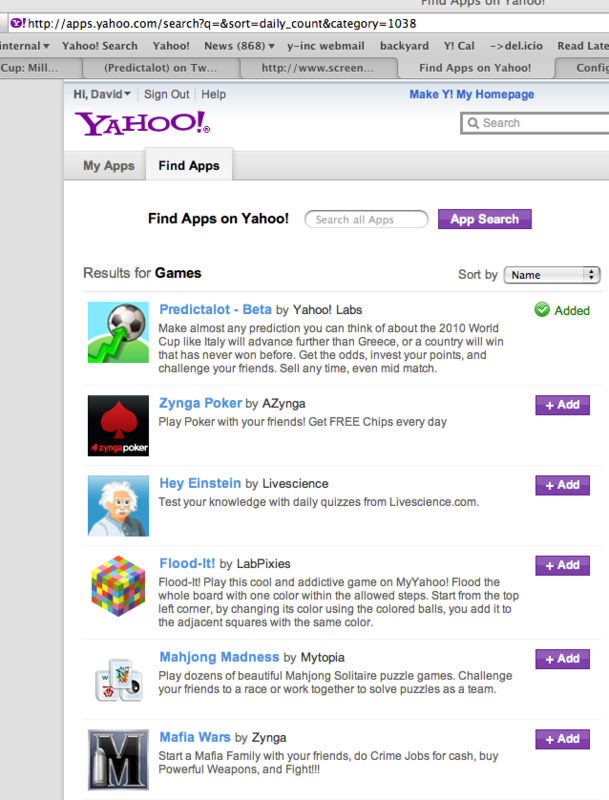 Predictopus is not a YAP — it lives right on the Yahoo! Cricket website, the official homepage for the ICC Cricket World Cup. They’re also giving away Rs 10 lakhs — or about $22,000 if my calculations are correct — in prizes. Everything is bigger in India, including the crowds and the wisdom thereof. It will be great to see the game played out on a scale that dwarfs our college basketball silliness in the US. The Y! India team reused some of the backend code but redid the frontend almost entirely. To adapt the game to cricket, among other chores, we had to modify our simulation code to estimate the starting probabilities that any team would win against any other team, even in the middle of a game. (How likely is it for India to come back at home from down 100 runs with 10 overs left and 5 wickets lost? About 25%, we think.) These starting probabilities are then refined further by the game-playing crowds. It’s great to see an experiment from Labs grow into a full-fledged product run by a real product team in Yahoo!, a prime example of technology transfer at its best. In the meantime, we (Labs) are still gunning for a relaunch of Predictalot itself for March Madness 2011, the second year in a row. Stay tuned. 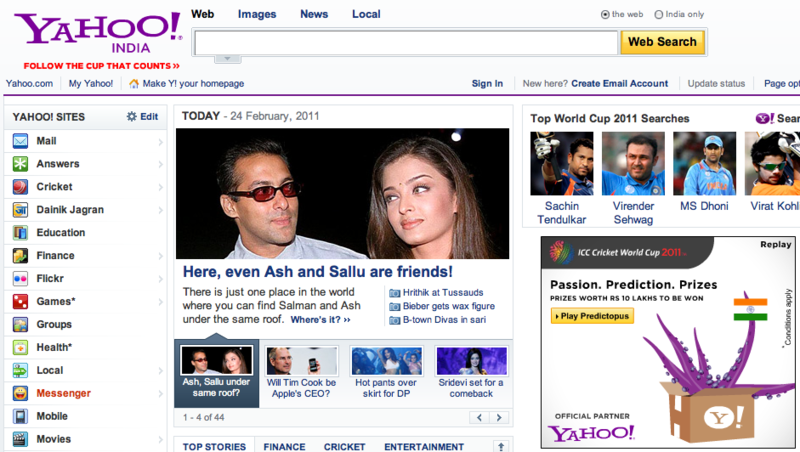 2011/02/24 Update: An eye-catching India-wide ad campaign for predictopus is live, including homepage, finance, movies, OMG, answers, mail, everywhere! Oh, and one of the prizes is a Hyundai. * Yes, that’s a reference to legendary Paul the Octopus, RIP. In 2003, we wrote a paper titled 1 billion pages = 1 million dollars? Mining the web to play Who Wants to be a Millionaire?. We trained a computer to answer questions from the then-hit game show by querying Google. We combined words from the questions with words from each answer in mildly clever ways, picking the question-answer pair with the most search results. For the most part (see below), it worked. It was a classic example of “big data, shallow reasoning” and a sign of the times. Call it Google’s Law. With enough data nothing fancy can be done, but more importantly nothing fancy need be done: even simple algorithms can look brilliant. When in comes to, say, identifying synonyms, simple pattern matching across an enormous corpus of sentences beats the most sophisticated language models developed meticulously over decades of research. In the paper, our clearest example of a question that we could not answer was How many legs does a fish have?. No one on the web would actually bother to write down the answer to that. Or would they? I was recently explaining all this to a colleague. To make my point, we Googled that question. Lo and behold, there it was: asked and answered — verbatim — on Yahoo! Answers. How many legs does a fish have? Zero. Apparently Yahoo! Answers also knows the number of legs of a crayfish, rabbit, dog, starfish, mosquito, caterpillar, crab, mealworm, and “about 133,000” more. Today, there are way more than 1 billion web pages: maybe closer to 1 trillion. What’s the new lesson? Given enough time, everything will be on the web, including the fact that hungry poets blink (✓). Ok, not everything, but far more than anyone ever imagined. * Lance agreed, predicting that IBM’s quest to build a Jeopardy-playing computer would succeed but not tell us much.